Paralympic Champion Makes The Case For Meningitis Vaccine : Shots - Health News Amy Purdy lost both legs below the knee to meningitis at age 19. She's now using her cred as a champion snowboarder to encourage teenagers to get vaccinated. Amy Purdy, who lost both lower legs because of bacterial meningitis, performs with Derek Hough on Dancing With The Stars. The last thing on your mind while you're home from school for the holidays is avoiding a deadly disease. But imagine catching a disease as a teenager — a disease so terrible that it takes not just months to recover, but requires sacrificing both your legs. That's what happened to Amy Purdy at age 19, when she was diagnosed with bacterial meningitis. It affects only about 4,000 people a year in the United States, according to the Centers for Disease Control and Prevention, but more than 10 percent of those people die. Others, like Purdy, suffer devastating consequences, including hearing loss, brain damage, or the loss of limbs from bloodstream infection. That's why the CDC recommends meningitis vaccine for all teenagers, especially if they weren't vaccinated as preteens. 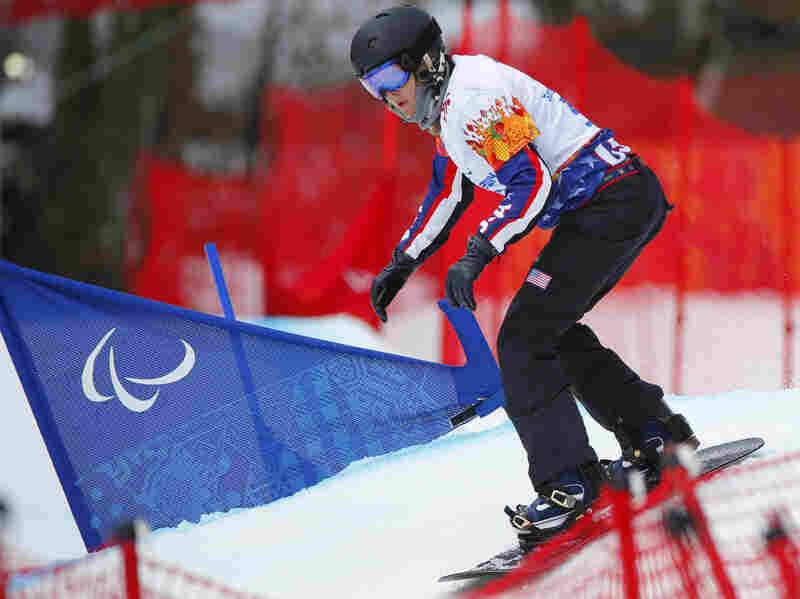 Purdy competes in the women's snowboard cross in the 2014 Winter Paralympics in Russia. Purdy, now 35, went on to become a Paralympic snowboarding champion and contestant in Dancing with the Stars. She's got a new book, On My Own Two Feet: From Losing My Legs to Learning the Dance of Life, coming out Dec. 30. Shots spoke to her about her battle with the disease and people's misconceptions about meningitis. This is an edited version of the conversation. Had you heard about meningitis before you became sick? Of course I heard the name meningitis before. I recognized what it was, but I had no idea that I was at risk. And I have to say, my mom actually told me just about a year before I got sick about one of her friends' son's who battled this horrific disease that came out of nowhere. He ended up losing his legs and his kidneys. It was the exact same thing that I got a year later. Do you know how you got meningitis? We have no idea how I got it. I was at an age that's more at risk — I was 19 years old. However, I wasn't a college student. I didn't live in a college dorm. I really wasn't even around that environment. They do say that those who are in college dorms are slightly more at risk than the rest of the world. I don't know how I got it, I was incredibly healthy at the time, I was a massage therapist, I worked out every day, I really took care of myself. It's just this invisible killer that kind of comes out of nowhere. How did you cope with this loss at such a young age? For me, it was life-changing. I nearly died multiple times in the hospital. I lost my legs, I lost my spleen, I lost my kidney function. I lost the life that I knew. And going through so much in such a small amount of time and so quickly, for me it put my life into perspective. There were certain things I focused on — I focused on how grateful I was for the things I had versus things I lost. I got a second chance at life and I wanted to use it. I didn't want to waste it by dwelling on what happened or why it happened. One of the ironies is that those losses actually led to a lot of great things, like Dancing With the Stars and the Paralympics. Definitely. The way I look at it is, we all have disabilities. We all have things that limit us and that challenge us. But really, our real limitations are the ones we believe. And I, from the beginning, believed that I could accomplish my goals and accomplish my dreams and I set out to do that. I'm very grateful that I've had the opportunities I've had. A new vaccine for meningitis B was approved this fall, and you're now working with the manufacturer, Pfizer, to promote it. How did that happen? Pfizer's actually teamed up with my nonprofit organization, which is called Adaptive Action Sports. I cofounded this organization in 2005 to help people with physical disabilities get involved in action sports, go snowboarding, skateboarding. Obviously, they want to get the word out there that there's protection against this bacteria. I'm really proud to be a part of this campaign, though. You hear about rare diseases and weird things happening to people on Oprah and Dateline and you just never think it's going to happen to you. And then come to find out you actually could've protected yourself against it. To me it seems like a no-brainer. What do you want parents to ask their teen's doctor about meningitis? The number one question is, "Do you carry the meningococcal meningitis vaccination?" I feel like if parents could vaccinate their kids against car accidents, they would. This is one of those things where there are ways to help protect your kid against this.